The first step to building a sustainable studio is to know how much you need to earn to keep yourself (and your family, if you have one) alive! The way to do that is to create a budget! Armed with this information, you can feel confident you’re taking this next step in your music career with your eyes wide open. 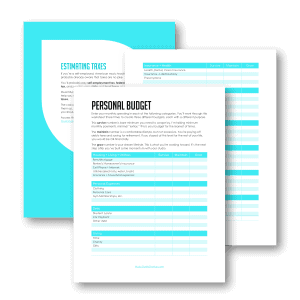 The printable personal budget worksheet I put together gives you a framework for creating a budget by listing some of the most common budget categories (and space to add your own). I use a digital system for maintaining my actual budget, but the planning part of the process just seems to work better on paper. Submit your email address to get the worksheet referenced in this post delivered to your inbox! Success! The budget worksheet is on its way to your inbox this very moment! In the budget worksheet, you’ll notice there are THREE amount columns. This is because you’ll essentially make three budgets, each with a different purpose. This survive number is bare minimum you need to scrape by. I’m talking minimum monthly payments, minimal “extras.” This is your budget for the leanest of times. The maintain number is a comfortable lifestyle, but not excessive. You’re paying off debts here and saving for retirement. If you stayed at this level for the rest of your life, you would be OK financially. The grow number is your dream lifestyle. This is what you’re working toward. It’s the next step after you’ve built some momentum with your studio. For each of the categories in the budget worksheet, estimate of what you spend each month. For a more accurate estimate, log in to your bank or credit card accounts and dig through those old statements. It may seem tedious, but it’s probably the most thorough record of your spending. If you primarily use cash, start tracking every payment you make over the next 30 days (ideally you’d be tracking indefinitely, but this is a start!). Don’t forget those annual and semi-annual expenses like car insurance or glasses/contacts! Divide annual expenses by 12 to represent the amount you should be saving each month in those categories to be able to pay the bills when they come due. Take it one step further by estimating the taxes you’ll owe on that income. This tax calculator will get you started! A budget can guide more than your spending. It should also influence how you set your teaching rates! Make sure you can earn your target income with a reasonable student load or you’ll burn yourself out trying to make ends meet. Obviously a budget is only helpful if you stick to it. Find a paper or digital system that works for you. I’ve been using YNAB since 2012 to track my spending and saving and I can’t recommend it highly enough! Grab the budget worksheet here to get started!